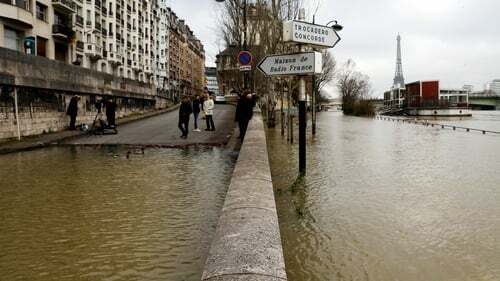 Nearly 1,500 people have been evacuated from homes in the Paris region, with authorities on alert for any major flood risk after the levels of the swollen River Seine rose further today. Michel Delpuech, head of the Paris police body, told reporters that around 1,500 people had been moved out of homes in the Ile de France region comprising the French capital and its suburbs. "The waters will only go away slowly," added Mr Delpuech. The Seine's waters are set to peak later tonight or early tomorrow close to levels which led to similar flooding in 2016, authorities said. The overflowing waters have already engulfed riverside walkways in Paris and led the world-famous Louvre museum to close a basement display of art. Paris's 'bateaux mouches' tourist boats have been shut down due to the high waters while swans have been seen swimming where there are usually footpaths and rats forced up onto the streets. Flooding caused destruction in Paris in 1910 when the Seine rose by 8.65 metres, although no deaths were recorded then.